LONDON--(BUSINESS WIRE)--The global strontium market is expected to post a CAGR of nearly 5% during the period 2018-2022, according to the latest market research report by Technavio. A key factor driving the growth of the market is the growing demand for ferrite magnets. Permanent magnets retain their magnetic properties even in the absence of inducing field or current. The global permanent magnets market is being driven by the modernization of infrastructure, technological development, increasing demand for efficient and miniaturization, and low cost. The permanent magnets can be classified into neodymium iron boron, samarium cobalt, alnico, and ferrite magnets. This market research report on the global strontium market 2018-2022 also provides an analysis of the most important trends expected to impact the market outlook during the forecast period. Technavio classifies an emerging trend as a major factor that has the potential to significantly impact the market and contribute to its growth or decline. Strontium nitrate is an acid salt of strontium, which is used as an oxidizer and colorant in fireworks. Oxidizers are one of the raw materials used in fireworks, which are the major contributors toward increasing pollution. The oxidizers feature high levels of oxygen and thus are used to set fire to different mixtures of fireworks. It is vital to use greener alternatives in place of current raw materials of the fireworks for a greener environment. “Barium nitrate and strontium nitrate are common examples of oxidizers. However, strontium nitrate is hygroscopic, and hence it immediately absorbs water vapor from the air. If fireworks equipment containing such a compound are stocked for a long time, they are likely to become damp and will fail to ignite,” says a senior analyst at Technavio for research on metals and minerals. This market research report segments the global strontium market by end-user (ferrite ceramic magnets and pyrotechnics/fireworks) and geographical regions (APAC, EMEA, and the Americas). The ferrite ceramic magnets segment held the largest market share in 2017, accounting for nearly 34% of the market. This end-user segment is expected to dominate the global market throughout the forecast period. The Americas led the market in 2017 with a market share of nearly 36% of the market share. The market share occupied by this region is anticipated to decrease during 2018-2022. 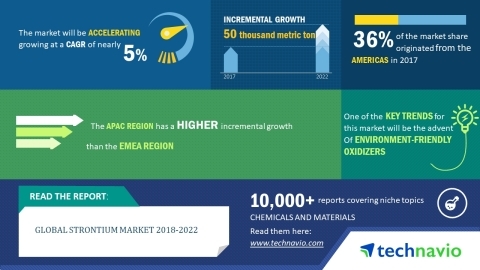 The global strontium market is expected to post a CAGR of nearly 5% during 2018-2022, according to the latest market research report by Technavio.